KingBob and and his merry band of Princes, Jesters and Peasants now moves on to the City of Brotherly Love, Philadelphia. 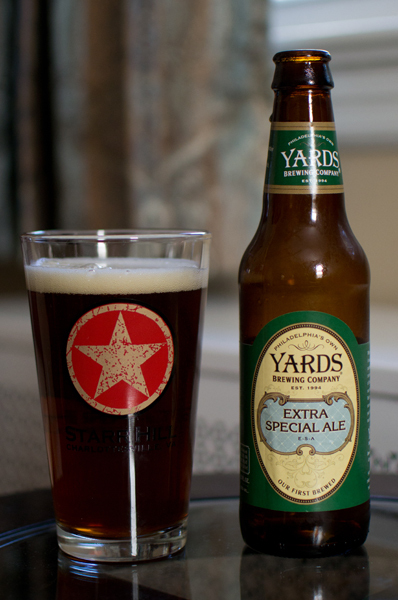 From this city in Pennsylvania comes our next brew, beer #343 which is Extra Special Ale by Yards Brewing Company. Their version of an Extra Special/Strong Bitter has an ABV of 6% and was Yards Brewing Company’s first beer brewed. Cool…lets give it a taste…shall we? It had quite a nice clear amber color just a bit on the dark side. The head was creamy, off-white and about a finger width in size. It left some really cool lacing on the glass. The nose was fairly light and consisted mostly of caramel malts and a faint fruity smell that I couldn’t put a finger on. I took a sip…the caramel malts hit me first. There was a pleasant toast like flavor there also. It was ever so slightly sweet. There is a decent hoppy bitter bite near the back of this that I enjoyed. I thought I picked up a bit of a nutty almost earthy thing in here also. The fruitiness I picked up on in the nose did not translate to the taste. It had a medium body and was pretty light in the carbonation. This was pretty solid. It was a pretty decent beer from the City of Brotherly Love. Wow…65 beers down. Only 300 to go. I wonder how many start something like this and actually finish it? Will I find enough beer to finish it? I think I will since I have found another great beer store, although this one is 2 hours away in Maryland. That store is State Line Liquors, http://www.statelineliquors.com/. Excellent selection and very nice staff to help you find whatever you are looking for. Check them out if you are near the Maryland/Delaware border close to Newark, DE. 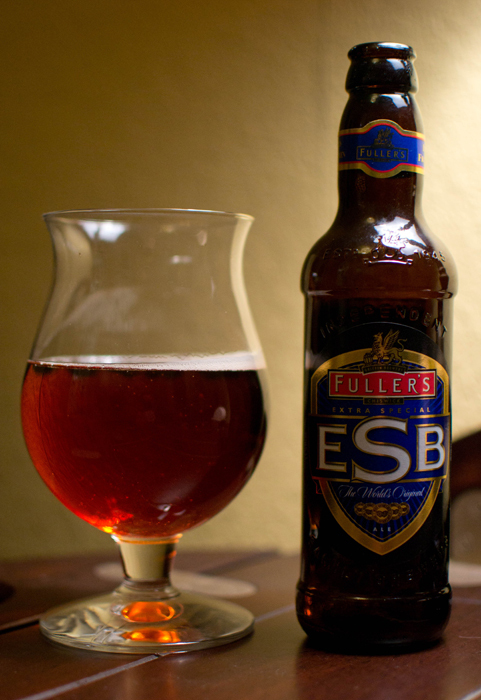 Beer #65 is Fuller’s ESB by Fuller Smith & Turner PLC. This lovely looking brew is an Extra Special/Strong Bitter or ESB. It has an ABV of 5.9%. ESB poured a lovely copper color with a wispy thin white head. 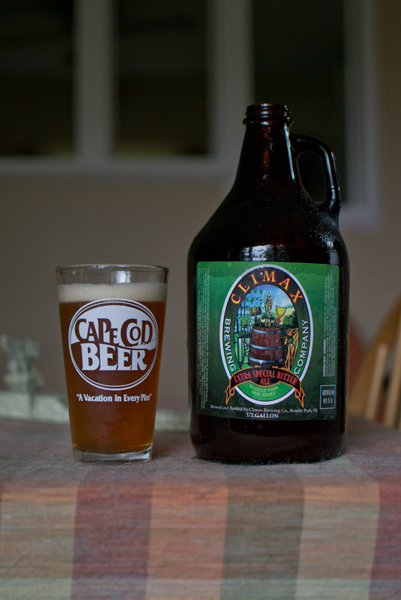 The nose was very pleasant, earthy with caramel malts, a hoppy almost floral scent, and butterscotch notes. The caramel malts came through most in the taste with a slightly sweet undertone to them. There was a fruity essence in here that I didn’t really get in the nose along with some bread like flavors. It finished with a nice crisp hop bite. Great mouthfeel, almost creamy, with some really pleasing carbonation on the tongue. It was very high on the drinkability chart so much so that I was wanting another as the last drop was being consumed. This is a very nice beer. It wasn’t bitter at all like the style may suggest. It had a wide range of aromas and tastes, I guess you could say it was complex in both of those areas but very well balanced. To me, this is what good beer is all about.